The equation is simple for Papua New Guinea, who must beat Samoa by five goals or more in Sunday’s opening game to secure their place in the last four. Francophone rivals Tahiti and New Caledonia will determine the final make-up of the semis when they meet in a repeat of the 2012 title decider. Following two hard fought draws against the defending champions and the runners-up from four years ago, PNG hold their destiny in their own hands. Dangerous striker Tommy Semmy’s return from suspension will be a major boost to the hosts who must go on the attack from the outset. Captain David Muta says the players will give all they have to thank the home crowd for their support. “It’s for the home crowd as they always make us stand up on our feet for the full 90 minutes. Because of the crowd the boys play their hearts out, we play for our home fans,” he says. On the back of two defeats, Samoa have nothing but pride to play for in their final group match. The tournament has been a big learning curve for the Samoans so far and coach Scott Easthope believes that every match is an opportunity for his team to gain valuable experience and improve. He says the players are looking forward to their final outing. “We’ve prepared for all of these teams to be really tough. 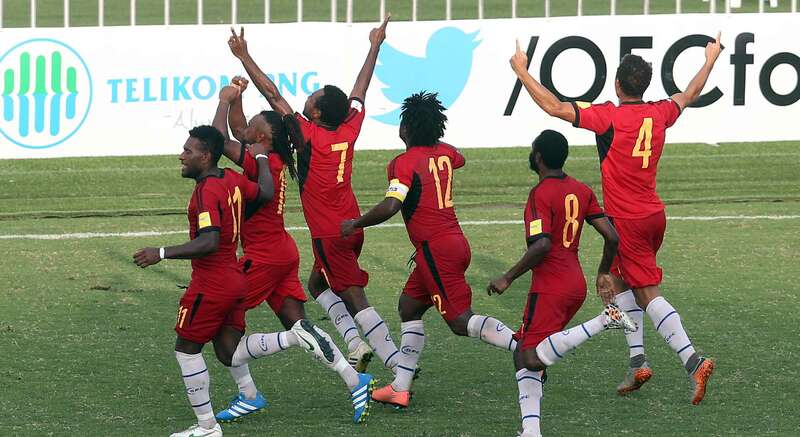 Papua New Guinea have been playing some really good football and obviously have some real speed in their line-up. Both Tahiti and New Caledonia will have one eye on PNG’s clash with Samoa before they lock horns in their much anticipated match at 7pm. The New Caledonians have a superior goal difference over Tahiti thanks to their 7-0 victory which means a draw will be enough for them to progress. On the other hand, Thierry Sardo’s men are well aware that a defeat would deliver a fatal blow to their Nations Cup hopes. Les Cagous will also be motivated to avenge their loss to their French Polynesian rivals in the 2012 title decider and Sardo is expecting a tough ecounter. Reigning champions Tahiti will be expecting a stern test to their title defence by New Caledonia. The Tahitians know that if PNG beats Samoa by five goals or more, they must win to keep their Nations Cup campaign alive. The French Polynesians will be without their talismanic captain Nicolas Vallar who is suspended for the match along with Tamatoa Tetauira. Coach Ludovic Graugnard admits that Vallar’s absence is a blow to his side’s chances. The players: Despite conceding 11 times in two matches, 19-year-old Samoa goalkeeper Faalavelave Matagi showed glimpses of his potential. The Samoan defence has been under tremendous pressure in both games leaving Matagi with plenty to do. With PNG destined to press forward in their quest to improve their goal difference, the teenage keeper is set for another busy day between the posts. The vital statistics: Having just 30 per cent of possession in both of their matches, Samoa’s defence has had to deal with a whopping 73 goal attempts, 31 of which were on target. Scott Easthope’s men had just a few opportunities on the counter to register six shots on goal so far in the tournament. The players: After serving his one match suspension for a red card, striker Tommy Semmy will be a welcome inclusion in the PNG squad. He will be looking to link up with Raymond Gunemba, who was in inspired form against Tahiti to grab a brace. The vital statistics: Compared to their nervy draw with New Caledonia in their tournament opener, PNG looked far more confident and dangerous against Tahiti. The hosts produced 11 more attempts on goal and four more shots on target in their second match. However coach Flemming Sterritslev will be concerned about his side’s inability to hold onto the lead. The players: 23-year-old playmaker Teaonui Tehau has been impressive in both of Tahiti’s matches so far. Following a double against Samoa he added a third to his goal scoring tally to earn Tahiti a draw with PNG. Steevy Chong Hue also offers plenty of attacking thrust on the left flank. The French Polynesians could be vulnerable at the back without Nicolas Vallar who will serve a one match suspension after receiving a red card against PNG. The vital statistic: In their previous two games the defending champions have displayed an attacking brand of football to amass 38 goal attempts and 15 shots on target. However coach Ludovic Graugnard will be concerned about his side’s tendency to give away far too many fouls. The Tahitians have conceded 38 free kicks as well as five yellow cards and one red so far. The players: Cesar Zeoula, a key member of New Caledonia’s 2012 OFC Nations Cup squad, has been lively and dangerous in both of his side’s games so far. He also showed his mental toughness by stepping up to convert a penalty against Samoa despite a morale sapping miss in his opening match of the tournament. Roy Kayara has backed up his eye-catching performance against PNG by grabbing a brace in his second outing at the Nations Cup. The vital statistics: Using their technical players who are comfortable on the ball, New Caledonia had no trouble controlling the lion’s share of possession against both PNG and Samoa. Thierry Sardo’s men are quick in transition and dangerous going forward. So far they have produced 64 attempts on goal and from their 21 shots on target eight have found the back of the net.